NEGBINOM.DIST Function in Excel calculates the Negative Binomial Distribution for a given set of parameters.it returns either probability mass function or the cumulative distribution function depending on input. Negative binomial distribution gives the probability that there will be a specified number of failures before a required number of successes is achieved. r: The required number of successes. number_f – The number of Failures encountered before the number of success. cumulative – A logical argument, if TRUE returns the cumulative distribution function.If FALSE returns the probability mass function. 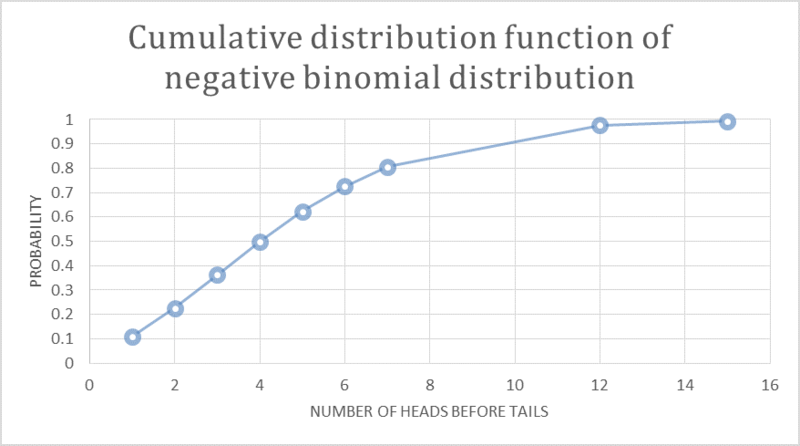 Let’s take an Example of Negative Binomial Distribution Function for the probability that the toss of a coin will result in exactly X Heads before 5 tossed Tails. When we plot the above result with number of failures before the success on x axis. We will get the probability mass function graph. When we plot the above result with number of failures before the success on x axis. We will get the cumulative distribution function graph.